The Office of Foreign Assets Control, or OFAC, is a financial intelligence and enforcement agency within the U.S. Department of Treasury. It administers trade and economic sanctions against hostile foreign governments, terrorists, international drug traffickers, those that proliferate weapons of mass destruction, and other organizations and individuals duly identified as a threat to the national security, economy, and foreign policy of the United States. OFAC succeeded the Office of Foreign Funds Control (FFC), which was established in 1940 just before the World War II when Germany invaded Norway. Initially, the FFC’s mandate was to protect occupied territories’ assets from Nazi use. When the U.S. joined the war, the FFC engaged in economic warfare against enemy states by imposing trade restrictions and blocking foreign-owned assets in U.S. jurisdictions. OFAC maintains a list of targeted organizations and individuals, known as the Specially Designated Nationals or Blocked Persons (SDN) list, and all U.S. persons are prohibited from engaging in transactions with anyone on the list, as well as other sanctions lists maintained by the OFAC. 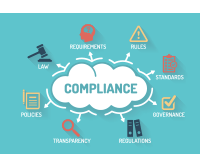 Why Should Banks Be OFAC-Compliant? The Department of Treasury, in no uncertain terms, requires “all persons and entities within the United States” to comply with OFAC regulations. The cost of not complying with OFAC rules, even if inadvertently, can be huge, with criminal and civil penalties running up to several million dollars (plus imprisonment for a willful violation). There’s also negative publicity to contend with because OFAC publishes the names of those that have been penalized. Perform due diligence to determine whether a “hit” is a valid OFAC match. Block transactions, including the opening of new accounts, that involve countries and entities on the SDN list. Reject transactions not involving SDNs but prohibited by sanctions laws. Report blocked or rejected transactions to OFAC within 10 business days. Provide an annual report of blocked property by September 30 of each year. The only way to maintain OFAC compliance is to make sure you’re not dealing with an entity in OFAC’s watch lists. However, manually scanning your customers’ names against OFAC’s databases is a formidable task, especially since OFAC frequently updates its sanctions lists. This is where Lyons Commercial Data can help. Our trusted OFAC compliance solutions include an extensive, built-in OFAC screening tool that allows you to screen your customers according to your specific needs. Any transaction a U.S. bank engages in is subject to OFAC regulations. As such, banks must diligently cross-check their customers’ names against OFAC’s sanctions lists to block or reject unlawful transactions. Failure to do so can result in millions of dollars in fines and penalties, not to mention a tattered reputation. For more information on how to maintain OFAC compliance, contact us today.